When NASA’s New Horizons probe launched in January 2006, it was hard to believe it would ever reach the dwarf planet Pluto. Many astronomy lovers were impatient to see what the dwarf planet looks like and eagerly waited for the moment it would pass by it. Now, NASA’s Pluto exploring probe is headed past Pluto and towards the Kuiper Belt, with the aim to learn more about the icy objects in the outer asteroid belt, while it’ll particularly focus on an object called Ultima Thule. 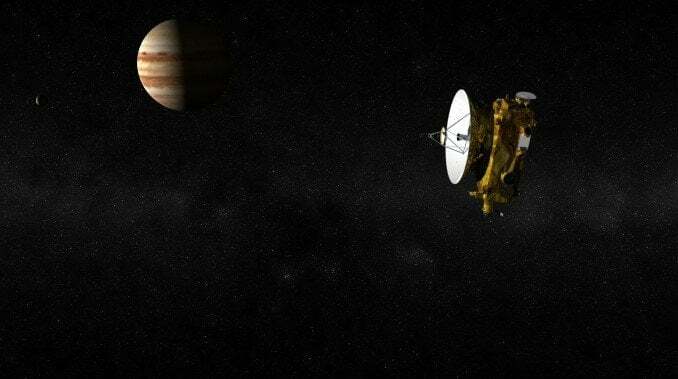 After being launched, the New Horizons probe got a huge gravity boost when it passed Jupiter, the largest planet in our solar system, in February 2007. It made a flyby of Pluto in July 2015 and spend six months gathering data from Pluto, while snapping beautiful pictures of the dwarf planet. Now, the spacecraft focuses on much colder objects, icy comets which live in the outer asteroid belt, also known as the Kuiper Belt. NASA’s Pluto exploring probe will pass Ultima Thule at 12:33 a.m. EST on January 1, 2019, marking the perfect New Year’s day for astronomy lovers. The flyby Ultima Thule can be watched on NASA TV YouTube channel, where there’ll be a discussion about the flyby and the live stream of the signal captured by NASA. The New Horizons Twitter account will also be active during the flyby, so that people will be able to follow textual updates in case they are unable to watch the stream. NASA will also host the livestream on the NASA Live website. Since the spacecraft is so far from Earth, the Ultima Thule flyby is very challenging for NASA engineers. It’s hard to know the exact location of the object, although NASA published several graphical representations of the New Horizons’ trajectory through the Kuiper Belt. As well, they aren’t sure of the potential location of nearby moons or hazards which could jeopardize the mission. The light conditions are also poor making it harder to keep in touch with the spacecraft. According to a report in Digital Trends, NASA has already known that Ultima Thule’s shape is not spherical, but that rather it boasts a kind of elongated shape, suggesting it could also be two objects which move close together. So, NASA’s Pluto Exploring Probe will have a lot of challenges on its way to the icy object.